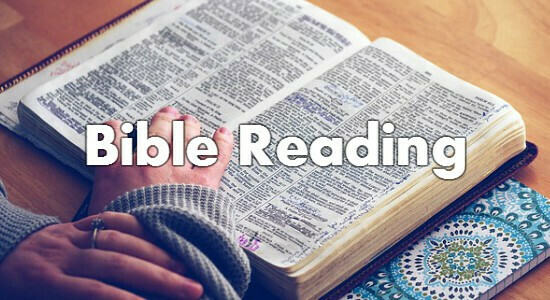 Whether you have no idea about the Christian faith or you have been a Christian for decades, Bible reading is always one of the most important things you should do. Want God to Speak? He already has - in His word. The Bible is radically different than any other book, blog, or magazine. In 2 Timothy 3:16, Paul says that "All Scripture is God-breathed and is useful for teaching, rebuking, correcting and training in righteousness..."
In other words, God is the ultimate Author of Scripture and Scripture is God's Word. And we believe, as Jesus did (John 17:7), that God's Word is always true. People search for God to speak in all the wrong ways. Want to hear God speak to you? Read the Scriptures. Want to find out about what it means to follow Jesus? Want to grow in your walk with Christ? God's Word is the best place to start, because God works through His Word. God spoke to create all things (Genesis 1). And through God's Word, He calls sinners to faith in Christ and opens their hearts to believe His truth (Romans 10:17). Through God's Word, He works in the lives of Christians to help them to grow to be more like Christ. Don't expect change in your life apart from God's Word. Dig in, read, and see what it has to say! The Bible is a big book. But reading the Bible for just ten minutes a day will radically change your life. Where you should you begin reading? There are plenty of Bible reading plans that make it easy. Below are a few that we think are helpful. This plan allows you to read the entire New Testament in a year by reading for five minutes a day five times a week. With each reading there are five suggestions for how you can dig deeper into the passage and apply it to your life. This plan takes you through the entire Bible in a year by reading four small sections each day. Each month has only 25 days of reading so that you don't get behind if you miss a day. This is the plan that Pastor Mark uses and that CHBC makes available in print format each year. McCheyne was a godly Scottish pastor in the 19th century who created a challenging Bible reading plan for his own use. This plan takes the reader through the New Testament and Psalms twice and the rest of the Old Testament once each year. Get a plan, choose a time, grab a cup of coffee, pray for God's help, and read. Don't get discouraged if you don't understand something right away. Keep a pen and paper nearby to write down questions you might have as you read. Ask a Sunday School teacher or a pastor to help answer questions you might have, or better yet, find someone to regularly discuss your Bible reading with as a way to have some accountability. Remember, God has promised to work through His Word and He never breaks a promise. Go here to find resources on memorizing Scripture.